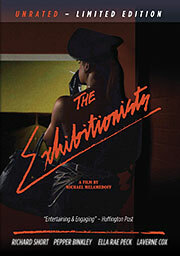 Michael Melamedoff’s The Exhibitionists was recently released on DVD by BrinkVision and now the soundtrack to the film is available for free listening and download on the website of composer Teddy Blanks. The soundtrack consists of 16 separate songs that can be played on the site or downloaded in a variety of formats. Fitting the mood of the film, the music has a dark, ethereal tone and, while modern, is also reminiscent of ’80s and ’90s exploitation film soundtracks. Blanks has previous scored Lena Dunham’s debut film Tiny Furniture and Alex Karpovsky’s Red Flag. The Exhibitionists tells the story of a sleazy documentary filmmaker exploits his friend’s sexual neuroses for his latest project during a decadent New Year’s Eve party. In a recent review, the Underground Film Journal said that the filmmakers’ style “requests the audience’s attention to take the events on-screen seriously, giving the film a weight that tends to be missing in today’s no-budget film scene.” We’ll add here that goes for the soundtrack as well. Visit Teddy Blanks’ website to download and/or listen to the soundtrack.